At Clonakilty Lodge Direct Provision Centre in west Cork. Residents of the direct provision centre with their friends from the community are holding a peaceful protest. 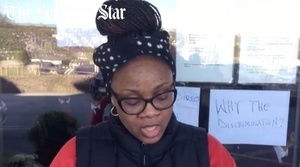 In the video by The Southern Star, above, a woman from the centre called Evelyn says they are angry that they did not get to meet Fine Gael TD and Minister of State David Stanton to voice their concerns about the centre’s living conditions when he visited the centre yesterday. Evelyn said the residents weren’t told Mr Stanton was visiting the centre, weren’t told why he was visiting and were given no information after he left – even though they’ve been waiting to meet with him. Evelyn said they’re requesting that Mr Stanton returns to the centre to meet with the residents. Posted in Misc and tagged Clonakilty Lodge Direct Provision Centre at 11:45 am on March 26, 2019 by Bodger. The recent inspection report for Clonakility seems fair enough. As you’d expect, It’s a handy earner. Generally knocks around Skibbereen and Baltimore rather than Clonakility.